In a whirlwind return to The Forest, the Rev. William J. Barber II T’03 delivered a pair of inspiring speeches that urged graduates to commit to a life of service. After the Theological School’s hooding ceremony, Barber shares a laugh with Professor of Religious Education Nancy Lynne Westfield. Whether in the pulpit or the public square, the Rev. William J. Barber II T’03 stands as a compelling orator—the theologian Cornel West has called him “the closest thing we have to Martin Luther King, Jr. in our midst”—and on this sunny May morning at Drew he does not disappoint. Barber has returned to campus from his home in North Carolina to deliver a speech at the Theological School’s hooding ceremony and, the following day, to address more than 500 graduates at the University’s 149th commencement, where he will receive an honorary degree in humane letters. Before several hundred seminary professors, graduates and their families gathered inside the Concert Hall at the Dorothy Young Center, Barber frames his speech around the Biblical story of Pentecost, when God infused 120 disciples gathered in Jerusalem with the holy spirit, delivered in the form of a mighty wind. The disciples were then sent forth to deliver the word of God. Addressing the graduates directly, Barber speaks in a low and deliberate voice. I want to suggest to you this morning that you were sent forth preaching. These times require, and the moral crisis we face demands, a political Pentecost in America today. Barber’s entreaty to the Theological School Class of 2017 inspires the first outburst of assent in a speech that will last nearly 35 minutes. It will not be the last. 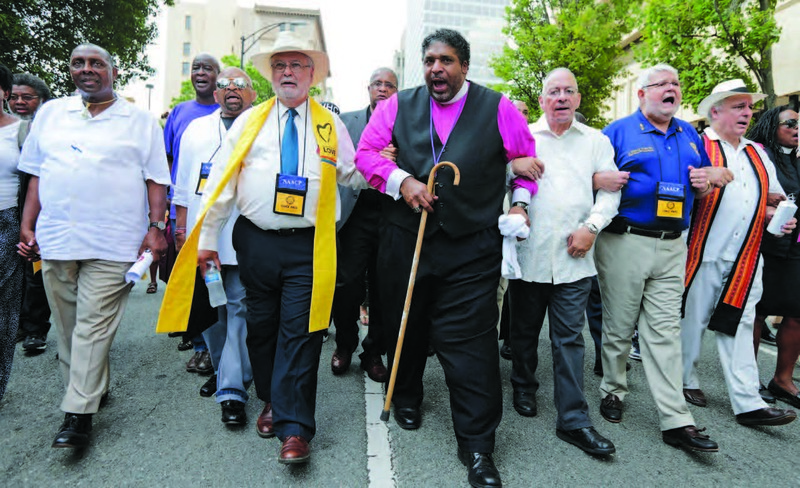 This is familiar terrain for Barber, who in 2013 founded the Moral Mondays movement, a series of protests against North Carolina’s conservative-dominated legislature, which had ended same-day voter registration, restricted early voting and cut funding for Medicaid, public education and programs for the poor. Although his politics veer decidedly left of center, Barber prefers not to get entangled in vernacular that inevitably pits Democrat versus Republican or liberal versus conservative, telling the graduates that such language is “too puny” for the task at hand, insisting these times require “a new tongue” to articulate a “moral agenda.” As he states his case, Barber’s voice begins to rise. And it’s clear when you find your moral foundation rooted in that language, then you understand something: It’s not about left versus right; it’s simply about right versus wrong. The crowd inside the Concert Hall lets forth a concurring chorus of oohs and aahs. Anywhere you pray, from Isaiah, from Jeremiah, from Ezekiel, from Luke, from James, it’s just wrong—Barber pauses—to take away health care from 20 million Americans. The audience—it’s his audience now—erupts in cheers. But Barber is just getting started. I’m glad about the Affordable Care Act, but let me tell you, that’s not really where our moral framework ought to be. Because health care is not something you ought to have only if you can buy it. Health care is a human right. His voice bellows. The whoops and cheers grow louder. And it’s wrong to blame our economic challenges on poor people, immigrants and people of color, while we give welfare to corporations in the form of dramatic tax cuts, and we treat corporations like people and people like things. That’s not right or left, it’s just—and now Barber holds up his hands and allows the congregation to finish the exhortation with him as his hands fall to his sides—wrong! Near the end of Barber’s speech, the Concert Hall takes on the urgency of a tent revival meeting, the steady applause and the spontaneous “Amens!” creating a sort of simultaneous call-and-response with the preacher’s sermon. Barber returns to the story of Pentecost, and the metaphor of the mighty wind, invoking slavery, the abolition movement, the civil rights movement and apartheid. Every time I see Moral Mondays, I see a wind blowing. Every time I see Black Lives Matter, I see a wind blowing. Every time I see women marching, I see a wind blowing. As founder of the Moral Mondays protest movement in North Carolina, Barber has campaigned against legislative cuts in funding for Medicaid, public education and programs for the poor. Barber’s speech intensifies, and his audience is cheering now through every word. Every time I see Muslims refusing to go into hiding, I see a wind blowing. Every time gay people say, “I’m going to stand up and be who God created me to be,” I see a wind blowing. Every time I see people fighting against voter suppression, I see a wind blowing. The graduates are now on their feet, soon to be joined by the Theological School professors onstage behind Barber. The clapping and hollering escalate, so that Barber can barely be heard. Barber pauses now, then resumes, his voice down low. There’s something blowing in the wind. Feels like justice to me. Feels like mercy to me. Feels like love to me. Feels like truth to me. His audience reaches a frenzied pitch. Barber is practically shouting. And when the wind blows us into the street, and we have the tongues that are necessary for this moment, and we have the illumination of this moment, we will see change come and we will be a part of another generation that refused to be silent because we got caught up in the Pentecost of our present moment. God bless you. And with that, Barber ambles back to his seat. The applause continues for nearly a full minute. 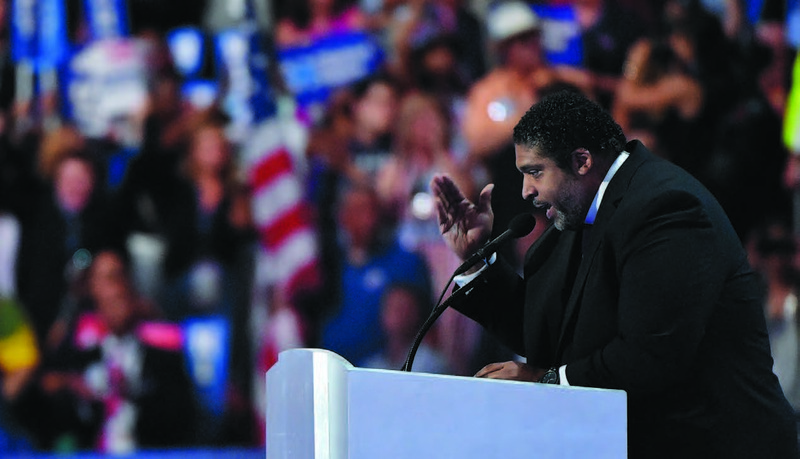 If the Moral Mondays movement made Barber a familiar figure across North Carolina, his rousing speech at last summer’s Democratic National Convention made him a national figure virtually overnight. The following day a headline in The Nation declared: “Americans Who’d Never Heard of Reverend William Barber II Won’t Be Able to Forget Him After Last Night.” Yet, in these hyperpartisan times, the attention has cut both ways. A cursory online search yields an ocean of invective against Barber too vile to print. But here, in The Forest, his celebrity is in full flower. After the hooding ceremony, professors and graduates and their families approach Barber with handshakes and smiles, and selfies proliferate. Barber has served for 12 years as president of the North Carolina chapter of the NAACP. But on the morning of his visit to Drew, newspapers across the state report that Barber is stepping down from the post to concentrate on another initiative, a modern-day resurrection of the 1967 Poor People’s Movement. The following morning, inside the Simon Forum, Barber receives his honorary doctorate from Drew President MaryAnn Baenninger before delivering the Sesquicentennial Address. Barber’s speech invokes Drew’s first president, John McClintock, who, two decades before taking the helm at the newly established Drew Theological Seminary, was charged (and acquitted) with inciting a riot “because he stood up against slavery and injustice,” Barber says. Thus does Barber exhort the graduates to embark on a life of service. And I pray today that all of you will be accused at some point in your life—that you will be accused of being a part of those who protest injustice in the name of love and in the name of truth and in the name of mercy. I, in fact, hope that this 149th graduation inducts you into the society of those past and present who recognized that in every generation somebody has to be charged for standing up for justice. By the end of the eight-minute address, nearly every person in the Simon Forum is standing and cheering. I pray that when you graduate here today, you will continue to try to be a servant of love and justice until the day comes that you meet your maker and you hear your maker say, “Well done, thy good and faithful servant.” God bless you. God bless you. At the far end of the stage, Barber slumps in his seat. His visit to Drew is nearly complete, but the Poor People’s Movement beckons. Barber’s work has just begun. Barber gained a national profile following a stirring speech at the 2016 Democratic National Convention. A new provost model further aligns academic planning and resource allocation with our core mission: students. At 372 strong, the Class of 2021 hails from 26 states and 18 countries. Four of our latest Civic Scholars share their good works on campus and back home. This veteran is more than a match for his next challenge: college. The Contemporary Art Semester celebrates 50 years of creative connections. Men’s soccer capped an incredible season by clinching a Sweet Sixteen spot in the NCAA Tournament. Pop quiz! How well do you know these campus icons—and the people who made them possible?